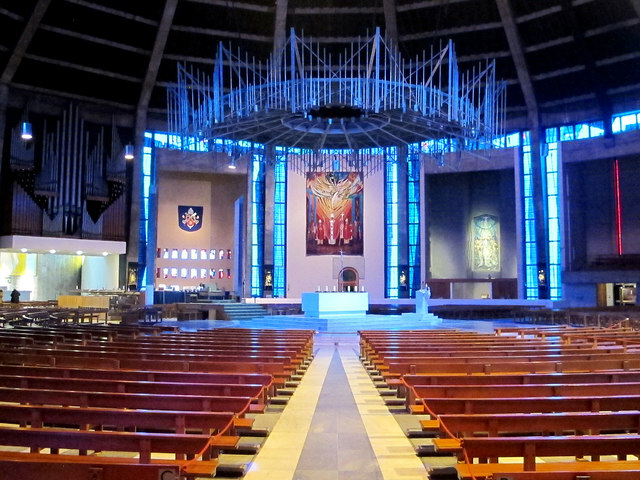 This third blog post on the architecture of Liverpool Metropolitan Cathedral focusses on the centre of the circle: the Sanctuary. Upon entering into the cathedral, ones eyes are immediately drawn to the high altar in the center of the space, and upwards to the seemingly endless lantern that crowns it. Described by the architect as the fulcrum or pivotal space from which the design of the cathedral was set out, the altar is placed directly in the center of the cathedral, raised up several steps, made of white marble and free standing so that the priest may celebrate either liturgical east or west. The same slab of marble was used for the altars in the Blessed Sacrament Chapel, the Lady Chapel and Baptistery, providing a liturgical unity between many of the primary objects in the cathedral’s worshiping life. Considering that most altars in RC churches to this point (mid 1960’s) were fixed against the east wall, this was a striking innovation. and secondly a tester, a smaller lighter structure usually suspended from above. Gibberd opted for the latter on the grounds that he did not want to detract from the visual environment of the sanctuary. Suspended some 30 ft above the altar, it’s design is reminiscent of a crown of thorns (rather appropriate in a Cathedral dedicated to Christ the King) but actually somewhat transparent in viewing drawing attention to the sanctuary area rather than to itself. As the building stood at the mass of consecration, the altar was the only permanent fitting in the sanctuary. 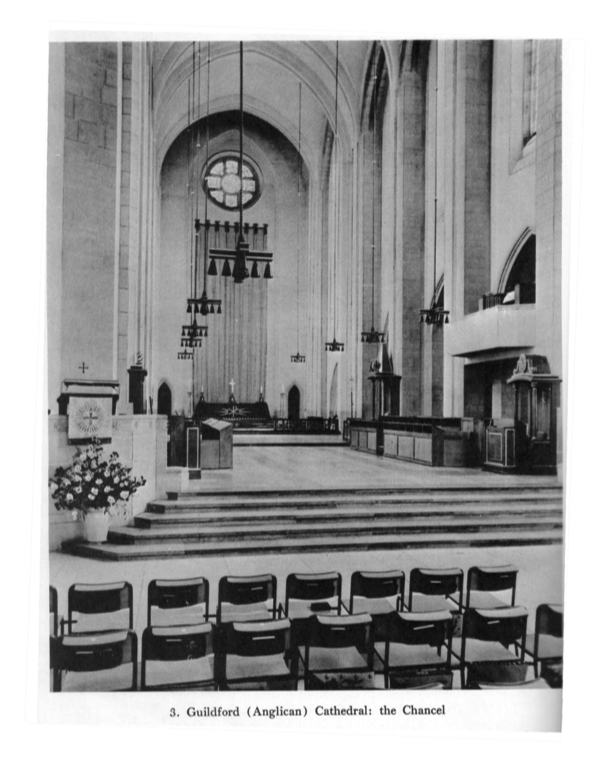 Designing a cathedral in times of liturgical change, both architect and cathedral authorities were aware of evolving expectations and needs of the space. 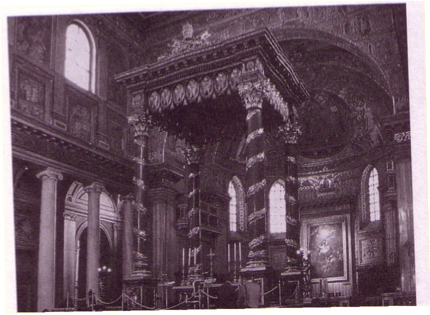 Prior to Vatican II most Catholic churches had two ambos, one to the right of the altar for the reading of the Epistle, and one to the left for Gospel. This was to allow special reverence to be given to the Gospels. Today all scriptural readings are usually read from the same ambo, the Gospels distinguished by their reading from the Book of the Gospels which is placed on the altar at the beginning of mass, and by their being read only by a priest or deacon. 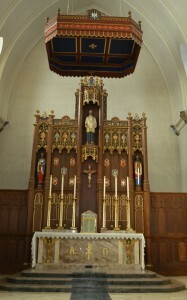 At the mass of consecration a single (moveable) ambo was used, placed on the left side of the altar. Whilst it is obviously preferable to have a permanent structure, this was clearly a sensible decision on the part of the architect not to anticipate what directions might result for ensuing liturgical reforms. Two interesting issues could be raised in regard to the sanctuary. Firstly, if the desire was for the whole congregation to be able to see the liturgical action taking place in the sanctuary – is this actually possible from those seats the furthest distance away? And if not, should the sanctuary have been raised higher, or the nave sloped for better sight lines? Whether the sanctuary is clearly visible form the rear pews is debatable depending on ones vision and height. 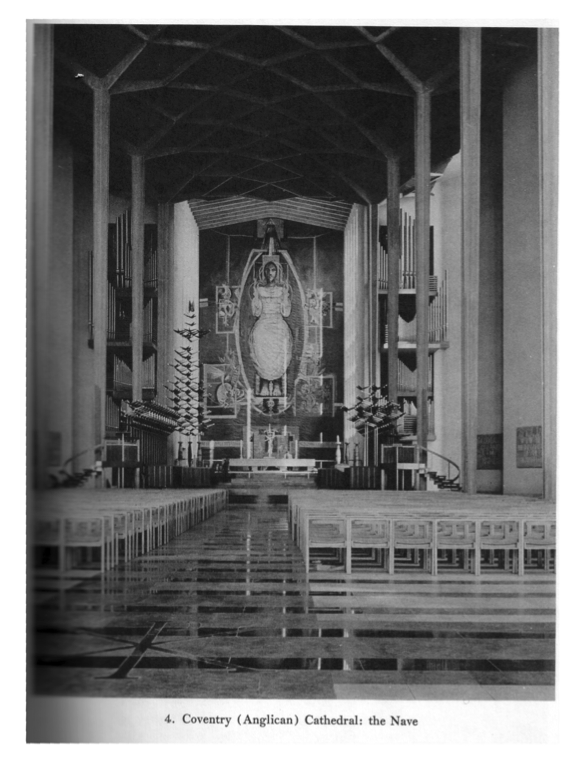 Interestingly, to combat this problem, Gibberd’s original design called for a sloping floor towards the sanctuary. 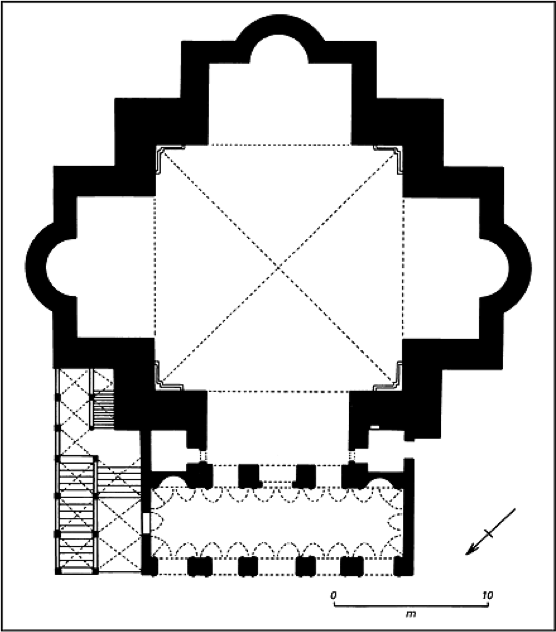 However this was subsequently reversed by the cathedral committee in conjunction with the architect, believing that it would turn the cathedral into an ‘arena,’ precluding the possibility of adaptation due to future liturgical change. However, one must wonder exactly how much change could be effected to the basic plan of the cathedral anyhow – the center of the space being filled by the altar is integral to the plan. However, it is clear that whilst the cathedral comes into its own for large scale celebrations of the Eucharist, it is not so suitable for smaller gatherings, especially those non–eucharistic occasions such as when the Liturgy of the Hours are celebrated. 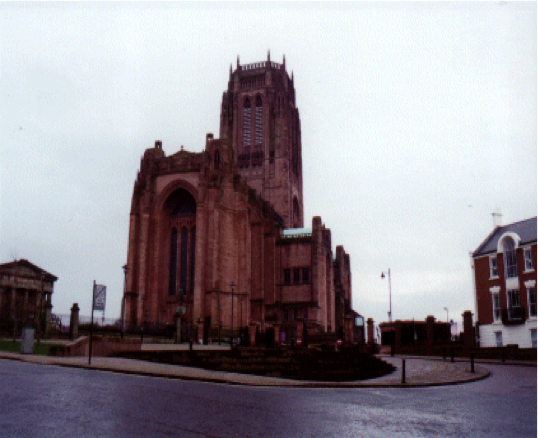 The first posting in this series examined the new Cathedrals built in England in the 20th Century, and previous attempts to build a Catholic Cathedral for Liverpool. This blog posting will look at the feature that perhaps makes the Metropolitan Cathedral unique, certainly amongst other English Cathedrals: its circular space. A circle has no beginning or end, one would imagine that such a shape would be entirely suitable for worship. So why then does the Christian history of church design not carry an abundance of round churches? In a circle ones attention is naturally drawn to the center, which in many cases is where the altar would lie. It is interesting to note that this spatial effect is also created by gothic buildings where the transept crosses the nave creating a central space that has an air of openness, often (as in the case of St Paul’s Cathedral) crowned by a dome. In many of these gothic spaces today, a temporary altar is erected in this central crossing for the celebration of the Eucharist. 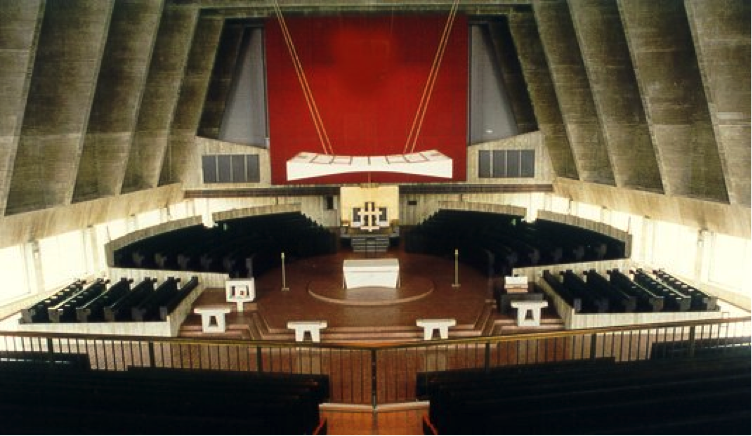 Gibberd’s genius took this ideal a stage further, building from the center out, rather than lengthwise as in the case of the classical and gothic forms, working on the principal that all must be able to see and hear the liturgical action taking place in the sanctuary. Whilst the idea of a freestanding altar is strongly supported in historical design, a gathering of people 360 degrees around the altar in worship is not. Obviously a flaw in this shape is the possible disenfranchisement of those who are behind the altar who may feel divorced from the liturgical actions taking place in the sanctuary. 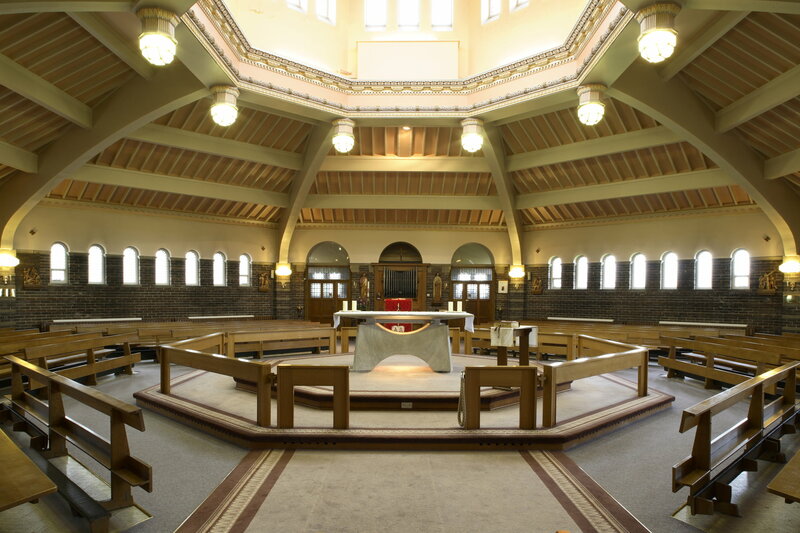 Gibberd addressed this issue by envisioning that on a week to week basis the congregation would be entirely within a 180 degree radius in front of the altar: the pews behind the altar only being used on those occasions that the cathedral was full to capacity. Whilst the idea of round churches is not found in abundance throughout history, it is not without both precedence and theological soundness. Centrally planned worship spaces were frequently built for specific functions in early church such as baptisteries (often octagonal) or the tombs of Martyrs. 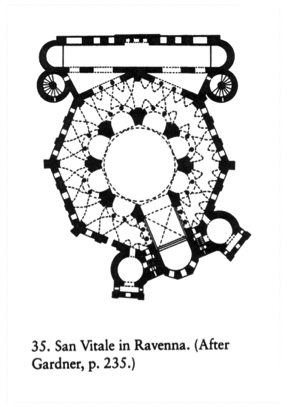 These circular, semi- circular and octagonal spaces, which may or may not have been the principal worship space of a given community, can also be seen in evidence in several Roman churches such as St Peters, and St John Lateran where seating for the clergy was provided behind the altar in a curved semi circular shape which may had figured a circular shape if the people were gathered in a similar position in front of the Altar. These centralized plans find their origins in that primary meeting place of culture: the Roman baths! 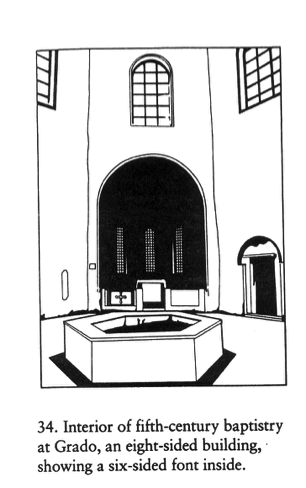 The placement of the bath in the center of the room, led in religious settings to the ‘bath’ becoming the pool in which immersion took place during the rites of initiation. 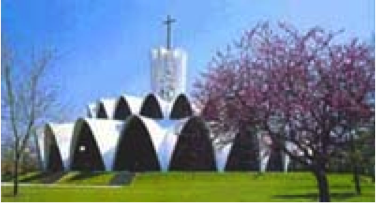 whilst Marcel Breuer’s massive church was designed for St John’s Collegeville, Minnesota. 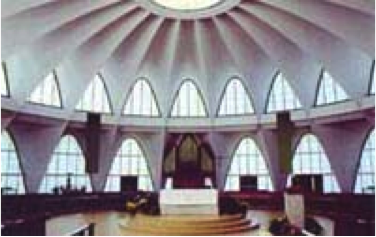 Having explored the use of circular space in Christian worship, the next blog posting will take an in depth look at the circular interior of Liverpool Metropolitan Cathedral. 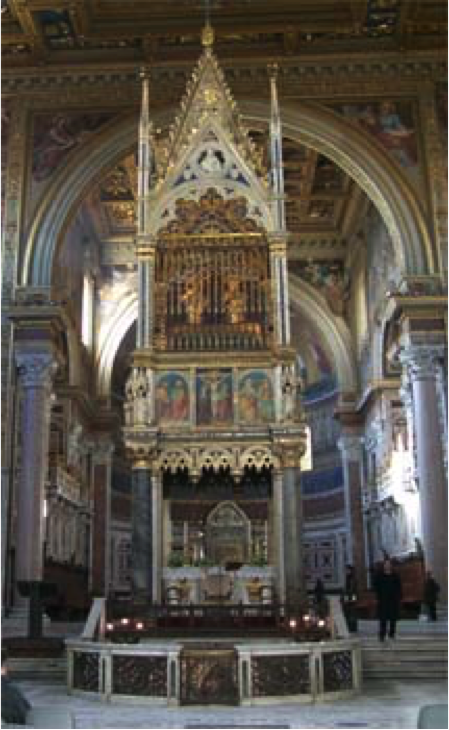 As well as the functional requirement of holding a cathedra, a cathedral church in itself is a theological statement reflecting the priorities and beliefs of those who worship in it. The theological and liturgical reforms of the Second Vatican Council have left many dioceses with the unenviable position of having a cathedral that may no longer accurately embody the theology expressed in the revised rites of the church. 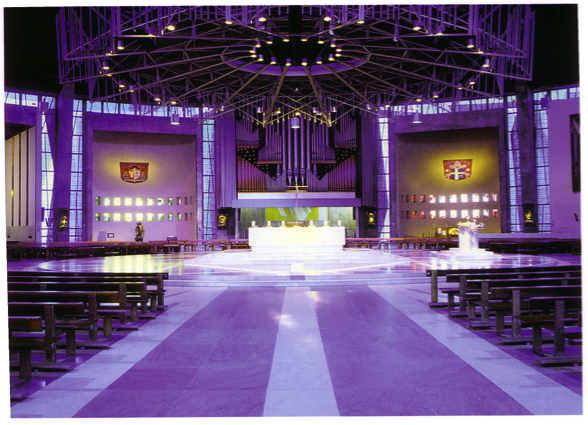 Consecrated in 1967, Liverpool Metropolitan Cathedral of Christ the King may be seen as among the first in a new generation of liturgical works of architecture that accurately support and teach of the ecclesiology proclaimed by the council fathers. This series of blog postings will explore the shape and form of the cathedral, noting the placement and relationships between key liturgical artifacts, both in terms of function and the truth that is revealed through them. 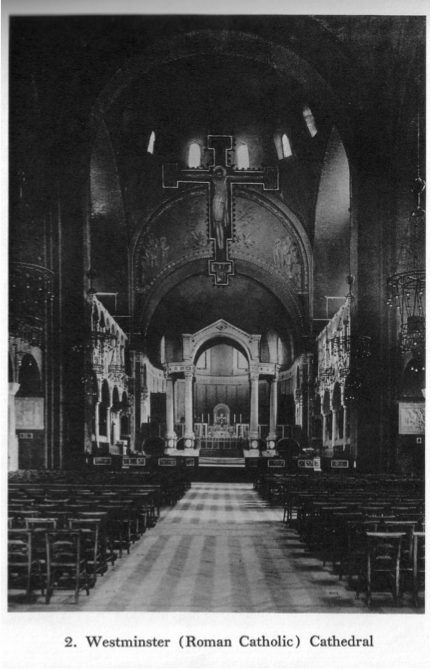 Of the five new cathedrals built in England during the twentieth century, three were staunchly traditional in conception, and four were liturgically conservative. Firstly, Liverpool Anglican Cathedral, the second largest cathedral in the world, designed in the gothic style by Giles Gilbert Scott, grandson of the eminent nineteenth century gothic revivalist. Also in a neo-gothic style, but of somewhat smaller proportions was Guilford Cathedral designed by Edward Brantwood Maufe. Reminiscent of the early Christian basilicas was the Roman Catholic Cathedral of Westminster in London, which combined the Roman baroque style with touches of Byzantine splendor. 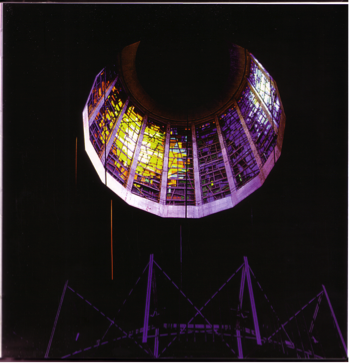 Extending the ruins of the nearly completely destroyed cathedral in Coventry, Sir Basil Spence showed qualities of spirit and imagination of the highest order to rebuild, though in a somewhat liturgically conservative fashion. 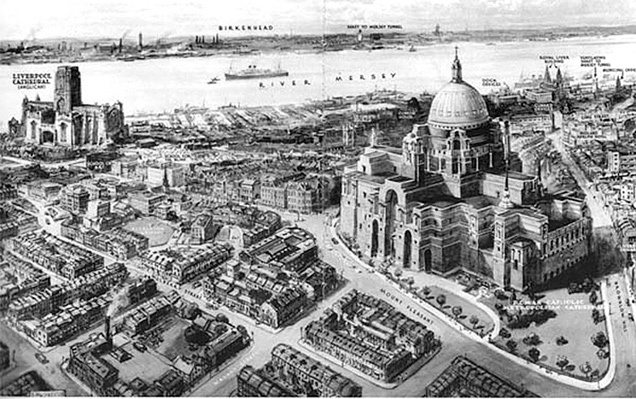 The current Metropolitan Cathedral in Liverpool was not the first attempt to build a Catholic Cathedral in Liverpool. 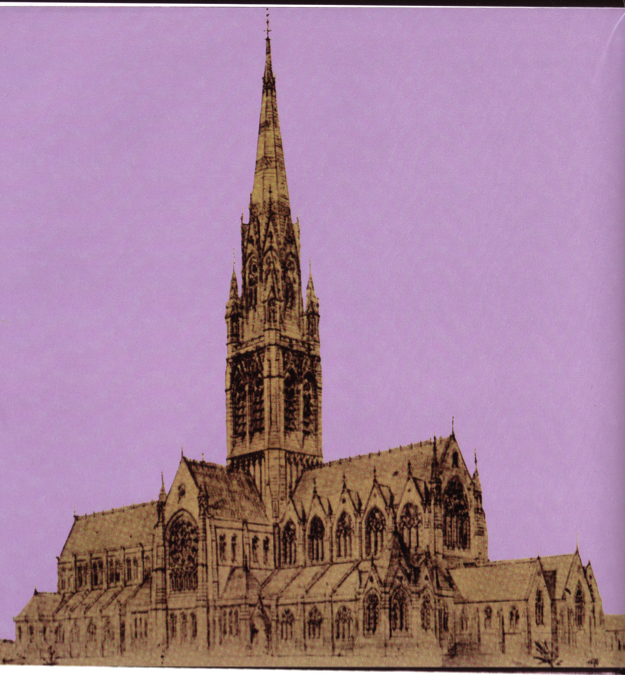 The first commission to design a Catholic Cathedral was entrusted to Edward Welby Pugin in 1853, son of the gothic revivalist Augustus Welby Pugin. Not surprisingly it was designed in a neo-gothic shape with a massive central steeple, but was only partially completed dues to a lack of funding. 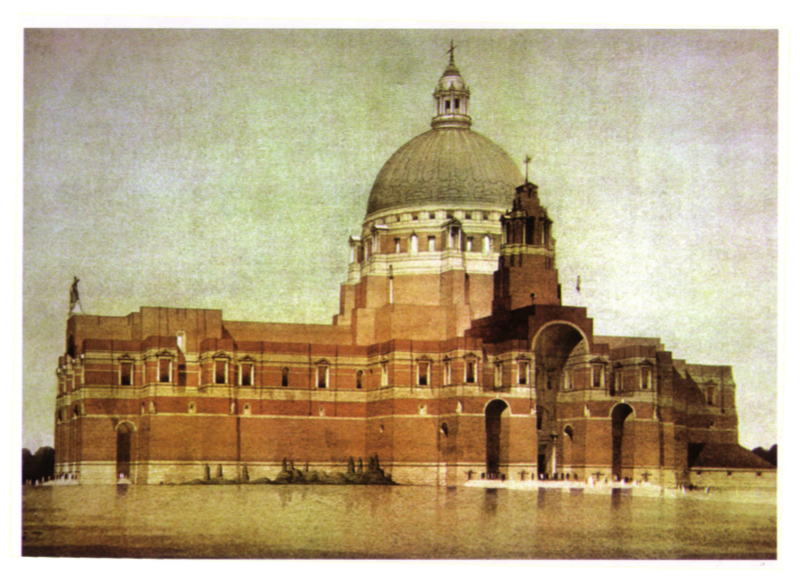 Sir Edward Lutyens was responsible for the second attempt, planning for a Romanesque cathedral that would hold 10,000 people, contain no less than 53 altars and be crowned by a dome of epic proportions. However, a lack of funds and the intervention of World War II ensured that only the crypt of Lutyens’ dream was ever completed. Lutyens design would have made the skyline of Liverpool look a little different! 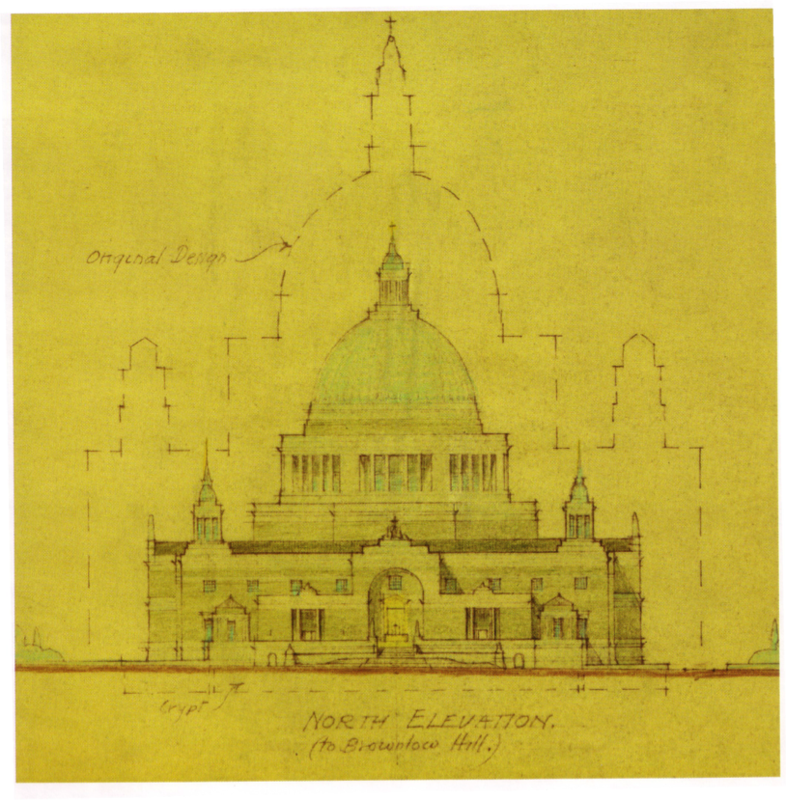 After the war and Lutyens’ death, Adrian Gilbert Scott (brother of the architect of Liverpool Anglican Cathedral) was commissioned to scale down Lutyens’ plan into a more financially viable proportion, but his work was heavily criticized and eventually dismissed. 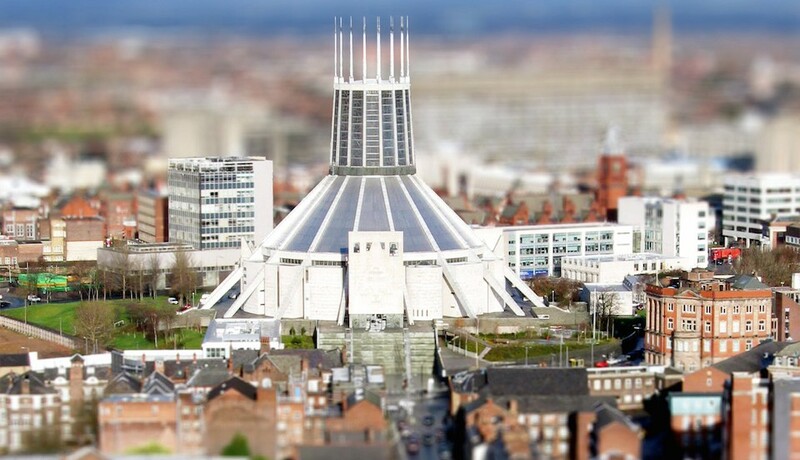 In 1958 a competition was held for what the Archbishop of Liverpool, John Carmel Heenan, described as ‘A cathedral in our time.’ Out of over 300 submitted designs, that of Frederick Gibberd was chosen. 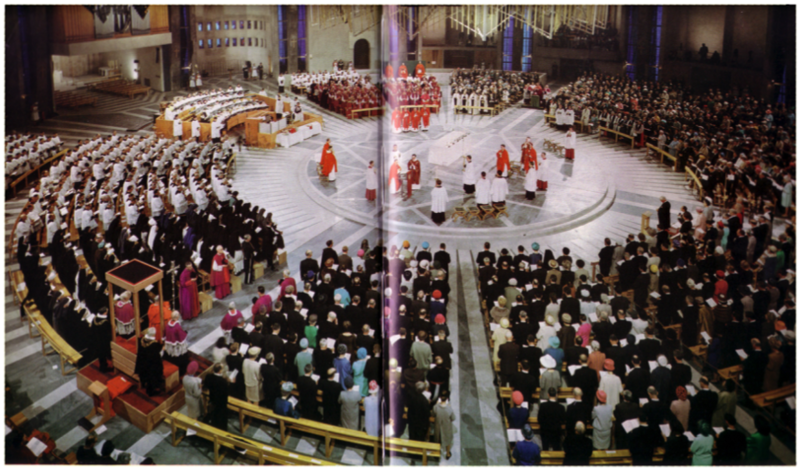 Building began in October 1962, and the Cathedral was consecrated on the Feast of Pentecost, 14th May 1967. 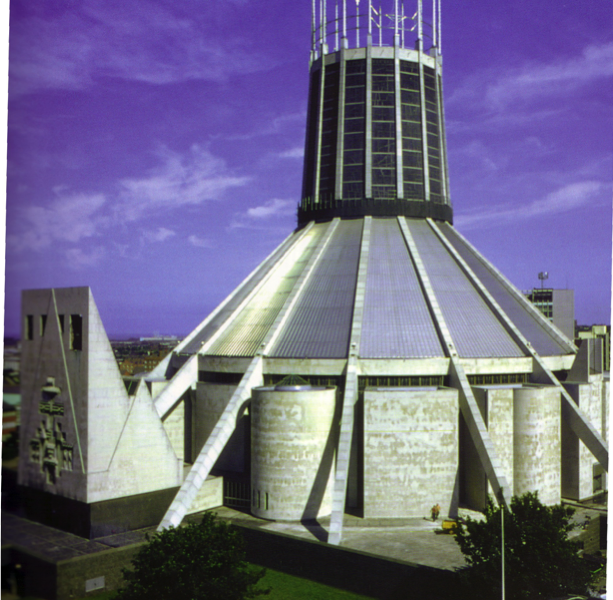 Frederick Gibberd was not renowned as a religious architect, in fact aside from the Metropolitan Cathedral and work on a London mosque, his work was completely secular. Architects were very much in demand after World War II to design, plan and construct new buildings. Among Gibberd’s principal works was the complete redesign of Harlow town center and work on the expansion of Heathrow Airport. Ironically, it is the Metropolitan Cathedral for which he is undoubtedly best known today. The complete break in tradition with those buildings that we have described above was due principally to shape of the building – that of a circle. The next blog post in this series will look at the use of circular space in worship. Ordained a priest for the Society of Jesus in 1584, Robert Southwell begged to be allowed to his home country of England, to minister among Catholics. To volunteer for such a mission was to face the certainty of martyrdom under the Protestant rule of Queen Elizabeth I. From 1586-1592, Southwell eluded capture, serving Catholics primarily in the rural south of England. This missionary work was abruptly cut short in 1592 by his arrest and subsequent torture and imprisonment, judged to be an enemy of the Anglican Church of England. Three years were spent in prison before his summary trial and execution in 1595. As the descendant of a reasonably ‘well to do’ family, Robert Southwell was permitted to have pen and paper in his prison cell. During this time he built on his earlier literary work, by composing several poetic works. These compositions sought not to extol material things, but rather to proclaim the magnificence and beauty of God’s spiritual creation. Unlike many of the other poets of his day, Southwell concentrated solely on the writing of religious poetry – work that was read by, and subsequently an influence on, the playwright William Shakespeare. It is clear that a brief analysis of Southwell’s frame of mind will contribute to the building of a poietic analysis of his poetry. A devout Catholic, who returned to England with the sure knowledge of death, Southwell nonetheless put others before himself, a heroic act that led to him being canonized and named as one of the 40 representative martyrs of England and Wales in 1970 by Pope Paul VI. Whilst he was known to be a popular writer in his day, little evidence other than his writings survive which would give us further insight into his process of creation of composition. Southwell’s writings display a high level of mysticism that we may assume derive from his personal transcendental experiences. His poems reflect sincerity, vivid imagination and references to both torture and one who awaits death. ‘The Nativity of Christ’ was written as part of a set of four Christmas poems, of which ‘The Burning Babe’ is undoubtedly his most famous composition. Written under imprisonment, it is worth noting that time would have ceased to be important. For a priest grounded in the liturgical year, with it’s annual cycle of the birth, death and resurrection of Christ, it must have been a great hardship to no longer be able to celebrate these mysteries. Thus, Southwell set pen to paper to express his thoughts on the incarnation of Christ, not for worldly uses, but rather as a form of comfort both to himself and his fellow imprisoned Catholics. It is not by chance that he set texts regarding the beginning of Christ’s life as he himself faced the end of his own life. The Nativity of Christ consists of four stanzas, each with six lines set in a decasyllabic form. The rhymes follow a conventional ABABCC form within each stanza, whilst the simplicity of the written text betrays the dense theological content, which touches on (among others) the mystery of the Trinity, Christ as the word made flesh and Christ as God’s supreme Gift to us. Whilst the poem remains in spirit faithful to it’s title, each stanza focuses on a particular angle of the act. Stanza 1 describes the birth; Stanza 2 meditates on the joy of the word made flesh. The 3rd Stanza dwells on Gods supreme Gift, moving in the last two lines to a personal application, before concluding in the last stanza with reference to the eternal redemption that destroys the sin of Eden. ‘Behold the father is his daughter’s son’ so reads the first line. This seemingly illogical statement can only be true if the Father and the Son are in fact one – a reference to two of the members of the triune God. The Son was not made, but begotten by the Father through the Virgin Mary, Mother of God. Southwell’s poetic opening sentence conjures up an image of God ‘passing through’ Mary to take our worldly flesh, without betraying Mary’s virginity. 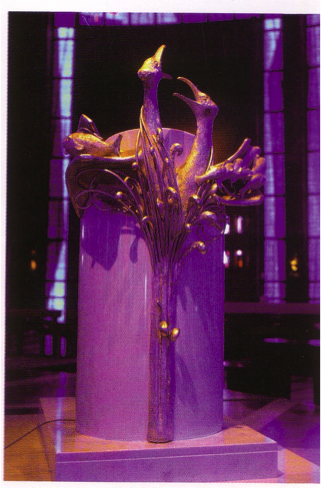 The reference to the bird and the nest is similarly a metaphor alluding to the same process by which God became man. Reference is made to the unending time in the kingdom of God, a gift now made possible for us by the birth of Christ. The rhyming couplet that concludes the first stanza refers to the son as both the ‘Word’ and the ‘mirth of heaven,’ illustrating the human nature of the child who is dumb, weeps and is feeble. So, this first paragraph tells us three things: firstly the relationship between God, Mary and the Son, and also the description of the ‘humanness’ of the son. The middle lines inform us of the consequence of the birth: the possibility of eternal life for us all. It is noted that in the first stanza, and indeed throughout the whole poem, that the only naming of God is simply that; God. There is no differentiation between God the Father and God the Son, which helps to underlie the theological impetus that the two are in fact one. Somewhat surprising however, is the absence of any reference to the third person of the trinity. Stanza 3 consists of two unequal parts. The first four lines is a complexed mystical exploration of the gift of God. Southwell plays on the words Gift, giver and given in what is the most dense writing of the poem. The rhyming couplet is unique throughout the poem, as it is the only time the writer turns to writing in the first person. Southwell here justifies our existence as being God’s gift, God giving himself freely to us as his gift and our life being for his purpose. This whole paragraph has a reverse psychological effect on the reader, the gifts of God flowing both from God to us, and from us to God: a two way process. This is particularly well illustrated by the consecutive use of both a noun and verb of the same base: ‘This gift doth here the giver given below.’ Whereas the first two stanzas specifically named modes of Gods presence in our world, this 3rd stanza seems to elude more to the mystical omnipresence of God both here and everywhere. The final stanza returns to the theme of nature (as found in the first stanza) with references to man and beast. The uplifting nature of this stanza reflects on the joy of the God in the flesh and its consequence of refreshing sinners. The first line refers to the sin of Adam committed in the Garden of Eden, and the role of the beast whom the Lord God condemned. Southwell then alludes to the birth of God as being the ‘new Adam,’ the one who restores the possibility of eternal life for us all. Hay plays a pivotal role in this stanza: ‘Beast’s food is hay, hay is all mortal flesh. Now God is flesh and lies in manger pressed As hay..’ This repetition elevates the importance of the ‘ae’ vowel contained in this word, the brightness of this vowel helping to express the joy of the word made flesh. Southwell’s writing style throughout the poem is lyrical, whilst at the same time the text is also didactic, leading one to wonder whether he used the text as teaching material for both Catholics and non-Catholic he may have encountered in prison. There is no clearly defined audience for the poem, rather the reader feels like a person ‘overhearing’ the text. The logical layout and self content of each stanza make ‘The Nativity of Christ’ particularly suitable material on which to meditate – a feeling of stability in the midst of chaos, and an opportunity to place our needs and desires in the light of him who sacrificed himself for us. What is the point of Catholic blogging? I see my blog as providing an opportunity for exploring topics which might not find a home elsewhere. Being a musician was not the career choice I dreamed of growing up as a young lad in Liverpool! My passion in my early teenage years was sport – football and rugby in particular. However, a series of nasty injuries put a stop to that. So what does an injury prone sports mad 15 year old do next? Well, take up the organ of course! As a regular church goer I had always been fascinated by the power of the organ, and I was lucky enough that my school had two organs that were used every day in assembly. Known as the ‘King of Instruments’ the organ offers a much wider scope than any other instrument, in fact it can (and does) replace an entire orchestra! As the organ can make very loud noises, there is never any danger of not being able to hear myself play! Once at university I became interested in conducting choirs. It is here that I perhaps approach my work in a slightly different way to fully hearing people. In addition to listening as best I can to what I hear the choir singing, I am also very conscious of watching choir members faces. It is said that a picture can represent a thousand words – often when people are having difficulty with a particular passage, or are trying to shape something in a musical way, they express this in their faces and in their body. I find eye contact between myself and my choir a vital aspect of what I am trying to achieve. Sometime I have my singers ‘mime’ so that they can focus on expressing what they are trying to communicate with their faces. I have been fortunate enough over the past fifteen years to work with young people in New Jersey, West Yorkshire and Liverpool, leading them in singing on a daily basis. The joy on their faces more than makes up for the lack of hearing I have! In recent years there has been a renewed popularity in religious themed music, both ancient (e.g. Gregorian chant, Bach) and modern (e.g. John Tavener, James McMillan.) The advent of CD’s means that those people who would never dream of entering a church are able to find enjoyment in music that is written for or about religion and the church. One wonders why, other than general availability, such music has become so popular. Is it a sign of spiritual hunger in an essentially materialistic culture? Or perhaps has sacred music lost its ‘sacredness’/ ‘religious function’ therefore allowing it to become popular? Probably there is no single cause. It is a reminder however, of the intimate connection between music (and the other arts) and religion. In his many encyclicals, Pope John Paul II addressed three principal elements of art: Truth, Goodness and Beauty. An artefact, whether a painting or a musical composition is not a natural object, but one shaped by an artist. Whether we are able to see God in a piece of music, one created by human hands, rather relies on how we view the processes of creating and receiving the artefact in question. How we see truth, goodness and beauty in a composition depends on what we consider to equal those things. Two lenses that we might look through to increase our understanding of how God may be seen in our singing are poietic and esthesic analysis. To look at some thing poietically means to look at how it came to be, examining the process by which it was created. Does it matter for example whether the person who wrote a hymn was a Catholic, or whether the tune was originally written as a pub drinking song? Would these, or other factors concerning the history of the music and text affect whether we are able to see God in it? The other lens is esthesically, how we receive or interpret an artefact. For example, the hymn ‘Eternal Father strong to Save’ is a well known hymn, but it will hold an additional set of values for those who have been involved in the Navy as it is often known as the seafarers’ hymn. Different images in different people can be thought up from the same text or piece of music. Let us take a CD of Gregorian Chant – a grandmother and granddaughter are likely to receive this music in very different ways. The granddaughter may well see the music as spiritual, meditative, soothing whereas for the grandmother it might bring back memories of Latin, strict schools and covering of heads in church. Singing in the liturgy is as old as Christianity itself. The gospels tell us that after Jesus and his disciples shared the last supper together in the upper room, they sang hymns together before proceeding to the garden of Gethsemane. Indeed, much of the evidence we have of singing in the early church is connected to meal times: a product of our Judeo-Christian heritage. The texts we sing are catechetical, in that they teach us, and help us to remember our faith. How many of us can remember songs we were taught as a child? Texts set to music tend to be memorable – I’m sure many of us can recall 10 hymn texts that we could sing the first verse without evening opening the hymn book! Singing with others helps to bond a group more closely together. It’s actually a great deal easier for a group to sing together than to mumble through a prayer at different speeds, different pauses for breath etc. As the church teaches, when we come together to worship God, we do so as the Body of Christ: what better to show our unity that to sing with one voice! We have seen that singing helps to bind us together as one body, is catechetical and makes liturgical texts more holy, and closely wedded with the liturgical action. However, are these reasons for singing for our benefit or for God’s? Put simply, to whose glory do we sing? The answer to this question stems out of the meaning of the word liturgy (from the Greek leitourgia meaning ‘work of the people.’) SC does not have one definition for why we ‘do’ liturgy, rather it offers several different interpretations each of which are equally valid. Liturgy and singing allows us to express the mystery of God, to give praise directly to him, to rejoice is his works and his gift to us. Liturgy and singing also allows us to become more closely associated with Christ by unifying as his body, clothing our offerings in glory. Whilst singing and music offer our praise to God, there is also a human side to liturgy and singing. We come together to worship as a group for spiritual refreshment, so that we may share in the joy of the resurrection with our brothers and sisters in Christ. Singing allows us to for example, to express our thoughts, helps us to focus on different liturgical seasons and remember particular events. Liturgy and singing are at once both God centred and human centred: we offer our praise to God, and he shares with us the wonders of his creation. On Saturday 6th December I will have the privilege of directing the combined choral forces of Liverpool Cathedral Choir, Liverpool Metropolitan Cathedral Choir and the Liverpool Metropolitan Cathedral Sinfonietta in a performance of Handel’s Messiah. Described by John Allen as a ‘Soap Opera‘ the recent Synod of Bishops on the family was indeed a remarkable event. The Relatio published at the end of the first week was described as a ‘pastoral earthquake‘ by John Thavis, but the final report published at the end of the synod watered down some of the more dramatic paragraphs of the relatio. Of course, the context of this whole discussion was the Cardinal Kasper presentation to the College of Cardinals back in February (subsequently published in English) responded to by a book published containing chapters by five other cardinals. The fault line of progressives and conservatives in the Church is nothing new. Perhaps the last time that bishops gathered together and were given the opportunity to speak their mind in such a free manner was the Second Vatican Council. At Vatican II there were also bishops who identified as progressive and conservative: however I would like to highlight a major difference between the conservative voice in Vatican II and the recent synod. Described as a ‘groundbreaking work of cultural and historical sociology’ Melissa J Wilde’s book Vatican II: A Sociological Analysis of Religious Change proffered the thesis that the progressives at Vatican II, though small in number, were far better organised and prepared to work together to achieve common aims. The conservatives, partly for ideological reasons (e.g. they didn’t believe in the idea of bishops acting together in groups such as episcopal conferences) struggled to present a unified and coherent argument. Wilde highlights three ‘chains of occurrence’ (p 17-22: Election of the conciliar commissions/ the debate on the liturgy schema/ the rejection of the schema on the sources of Revelation) which shifted the momentum from the curia (who had prepared the groundwork for the council) to the progressive faction. The conservative response in the recent synod I would suggest, was far stronger and better organised than during Vatican II (as demonstrated by Wilde’s analysis.) This I would suggest was largely down to the power of the media, both traditional (books, newspapers etc) and social (Facebook, twitter, blogs etc). In the first instance, the Cardinals who contributed to the book Remaining in the truth of Christ were able to respond to the original proposals of Cardinal Kasper in their own words. Newspaper interviews from various leading synod participants outlined the key issues in the weeks and days leading up to the synod. Surprisingly perhaps, the synod worked on a similar basis to Vatican II, whereby individual speeches during the first week were not immediately published, but rather a daily ‘summing up’ press briefing was given. This of course allows those involved in such a press briefing to ‘control’ the message to be distilled. Social media came to the fore upon the publication of the relatio on October 13th. Conservatives rallied across Twitter, Facebook and blogs that church doctrine and teaching was being diluted. Equally, the more conservative synod participants seized the opportunity during the Circuli Minores stage of the synod (small group discussion in common languages) to correct what they saw as misrepresentations of church teaching or doctrine. Upon reconvening in the Synod Hall it was announced that the reports of the Circluli Minores would not be published, however a conservative outcry led to their publication being subsequently ordered. It could be suggested that the Synod leadership had developed an awareness (due to the speed of social media) of just how much interest was being paid to the synod, and a growing insight into the importance of transparency. A clear development therefore can be seen between the influence of the conservative faction at the recent synod as opposed to that at Vatican II. Whereas most of the conservative positions ( particuarly at the outset) at Vatican II were (at best) diluted, at the synod the conservative voice was heard (particularly during the second week) and contributed to the weakening of some of the more contentious paragraphs of the previously published relatio. Whether this strengthening of the conservative voice was due to better organisation amongst the more conservative synod members is unclear, but what is certain is that social media certainly played a role in both keeping synod participants abrest of how the relatio and other parts of the synod were being received around the world, and also succeeded in applying pressure which subsequently appears to have affected events at the synod itself, such as the publication of the reports of the Circuli Minores and the content of the final report itself.